Fabric was Tidrickâ€™s partner in "Absentia" and you canâ€™t imagine how many movements can be made with this combination. Stilts were not used in this production, but they look wonderful. 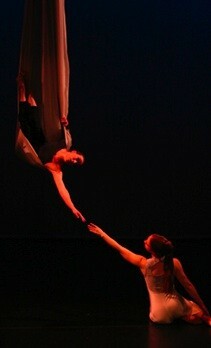 Drama on the trapeze, a natural. There are probably easier ways to do a split. Above and Beyond Dance was founded by brilliant performer and choreographer Chriselle Tidrick to fuse movement ideas from the circus art with those of dance. Chriselle started in the nether zone of gymnastics, so she was always tampering with and expanding what her body and limbs could do. Her fall program offers the world premier of Raw, a two part piece in which three dancers, recently killed, are dumped to hang on trapezes in a locker. The butcher has a curious relationship with the carcasses, and ends up joining them. It is a strange piece, but so powerfully constructed and performed that you can’t take your eyes off the dancers. 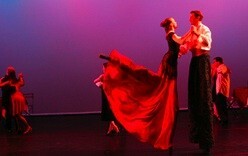 Noted also this evening were dramatically evolving facial expressions which magnify the emotional content of the dance. Nicholas Csicko’s musical accompaniment was arresting and secured the story in sound as was Reinaldo Moya's. Unfamiliar music was perfectly chosen for each piece. Represented are Carlos Libedinsky, a commissioned piece by Lauren Buchter, Astor Piazzolla and the more familiar Arvo Part. If Tidrick’s goal is to “extend the range of line and movement beyond...traditional dance,” she has done this and more, with style and excitement. You haven’t seen anything like this until you attend one of her performances. Jacob’s Pillow should invite AboveandBeyond Dance so you can easily enjoy.